Our four-day stay in Paris couldn’t have been better, if it wasn’t for the bad weather, we could have considered it a complete success. It was our first city trip with Baby M, she was six months old, an age a lot easier to travel than two months old, the age she was when we went to the Maldives. The great thing about returning to a city you already know with your baby, is that you don’t feel pressured to visit all the must see attractions. This way, you’re more relaxed and ok with the idea of changing plans and visiting it in a slow pace. We took our time and still managed to see even more than what we expected. 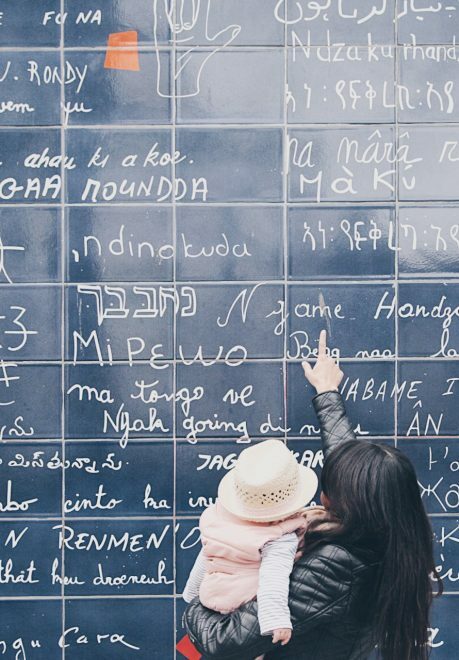 We also had an entire different experience in the city, and learned a few things and tricks about traveling to Paris with a baby, so we put together our tips on this post, and hope the information will be useful to those dreaming of taking their little one(s) to the city of love. As long as you can. I say that because there is so much to do in Paris (even if you have been there before) and also because the city is huge. If it’s your first time in the city stay at least 4 days if you want to manage to see the main attractions with a baby in your arms. As central as possible, it will make your life a lot easier with the baby. The best areas: Saint-Germain-Des-Prés, 1st (near the Louvre), 2nd (around Opéra) and 8th (near the Champs-Elysées) arrondissements. Also consider: Le Marais, the 7th (near the Eiffel Tower) and 16th arrondissements. Apartments or hotels are recommended. Apartments are practical in terms of preparing your baby’s food, but they aren’t always cheaper than hotels. So pick what’s best for you and your family, we managed just fine staying at a hotel, though finding the ideal one might not be the easiest task. Tip: try to read reviews from other families who stayed at your accommodation and see what they thought. Honestly? Basically the main attractions and activities you would do also without a baby in the city, in this sense Paris is very baby friendly. 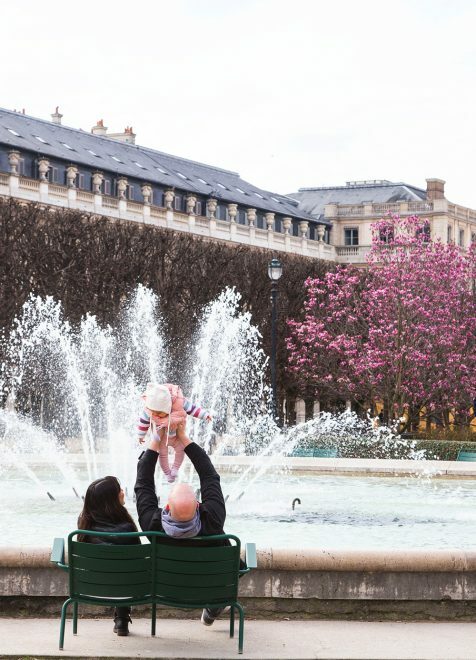 Museums, parks, cafes, walks around the city, landmarks like the Eiffel Tower, boat rides on the seine, Montmartre, you name it, almost everything is possible with a baby. My tip is to make a list of places you REALLY want to visit and prioritize them, then, if you still have some extra time you can focus on the remaining places. What I always do is to create a Google Map (My Places) with all the places we want to visit, including restaurant recommendations, which I can access from my phone. This is amazing when planning which routes you want to take and when, since you need to be flexible because of your baby’s schedule. Also, plan ahead and check the attractions website to know if it’s possible to take a stroller or even your baby. Some attractions, like the Catacombs, aren’t recommended for babies, others are impossible to take a stroller along. Musée D’Orsay: large strollers and baby carriers: not allowed, though you can rent a pushchair at the museum. There are several different ways with different price range to travel between Paris and its main airports Charles de Gaulle and Orly. However, if you’re traveling with a baby and with a stroller, the most affordable and practical way to do so is by taking the bus. We took the Roissybus from Charles de Gaulle that travels directly from the airport to Opéra (12EUR each way) from where you have great connections to get around the city. The bus offers free Wi-Fi (though not the best connection), room for strollers and luggage. The journey takes about 60 minutes from Paris-Charles de Gaulle to Opéra depending on the traffic. It’s not the fastest option, but we found it the easiest and stress free when traveling with a baby and stroller. Check the routes, timetable and prices of the Roissybus here. If you ever took the subway in Paris, you certainly didn’t forget the amount of stairs you had to climb. Now imagine doing it with a stroller. No, not the best idea. Even though not all stations are stroller unfriendly, I still didn’t find that taking the subway when you don’t know how every single station looks like, to be the best public transportation option in town. 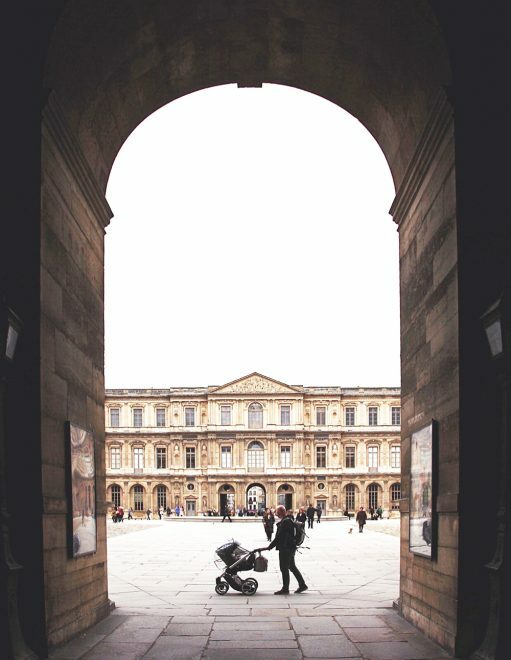 The best way to get around Paris with a baby and a stroller is no doubt on foot, and if like us you are the kind of traveler that love just getting everywhere walking, you will love doing it in Paris. Each day we walked about 11km, yup! However, if you aren’t willing to walk that much and get everywhere faster and hate the idea of taking thousands of stairs with a stroller, well, bus is the definitely the best option. You will find that taking the bus is very practical, there are places reserved for strollers inside them and seats for mothers. We had a great experience with them during our four-day stay, and can only recommend it, and no, it’s not complicated at all to find which bus goes where. Our tip: download the RATP (the city’s public transportation company) app to easily find connections and bus stops around the city. If you have no idea where to take each bus, the map on the app shows you exactly where to go, not to mention the schedule. 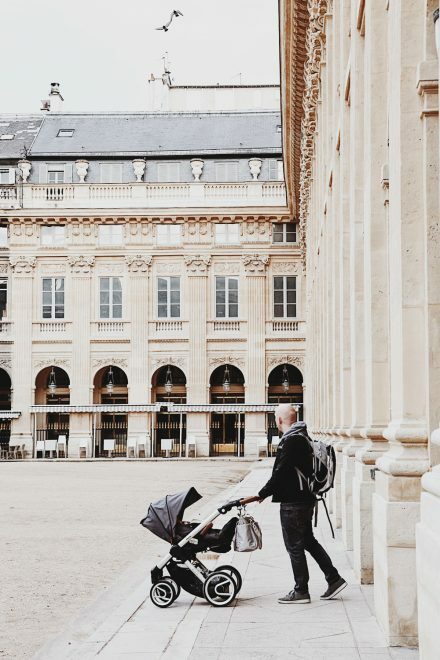 Our biggest challenge was where we could change Baby M on the go, considering we spent basically from 08:00 – 16:00 strolling around the city, away from the hotel and the fact that changing tables in Paris are rare. Since the weather was a bit cold, we didn’t find it appropriate to change her at open areas, such as in a park. What did we do? We ended up discovering that the majority of the Starbucks have a changing table in their restrooms, as well as elevators for strollers to go up the first level. 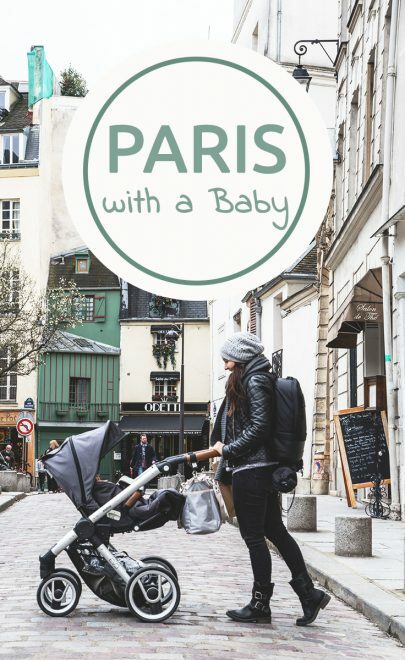 I know, Starbucks instead of a traditional Café or Brasserie while in Paris isn’t your plan, but what can you do when you really need to change your baby? Apart from that, whenever we didn’t manage to find a changing table, we changed her discreetly where we were seated (not the best option, but still better than outdoors in the cold weather). During the warm months changing diapers on the go is way easier. All you need is a park and a changing pad and there you go. Other places where you can find changing tables are at the department stores Galeries Lafayette and Printemps, the Eiffel Tower (at the parvis, 1st, 2nd floors), at some museums such as the Louvre and Musée D’Orsay, and at the airports. Paris is very open and friendly when it comes to breastfeeding in public. Baby M still breastfed every 3 hours during our trip, so we had to do it many times around the city. The experience was very pleasant for me as a mom, no one ever stopped to stare, like it often happens here in Germany. What I always do is, I take a breastfeeding scarf wherever we go, and problem solved. As for eating out, know that most restaurants and cafes in Paris don’t offer much room for strollers, another challenge we encountered. We had trouble at different cafes and their waiters, as they weren’t really happy with the fact we had a stroller with us. Oh well, we didn’t care and managed to find a place without their help. But it’s important to know that this might happen to you too. On the other hand, we also had great experiences eating out in Paris with our baby, some waiters were very friendly and did their best to make us comfortable. Tip: if the weather is good take a table outside or take supplies for a picnic in a park, one of the best things to do in Paris. Sunday 11:00 a.m. to 07:00 p.m.
Monday, Wednesday, Thursday, Friday, Sunday from 9:30 a.m. to 8:00 p.m.
Tuesday & Saturday from 10:00 a.m. to 8:00 p.m.
Baby carrier: not only they are practical for reaching places where the stroller can be trouble, but also good to provide a little change for your baby who will probably spend a lot of time in the stroller. 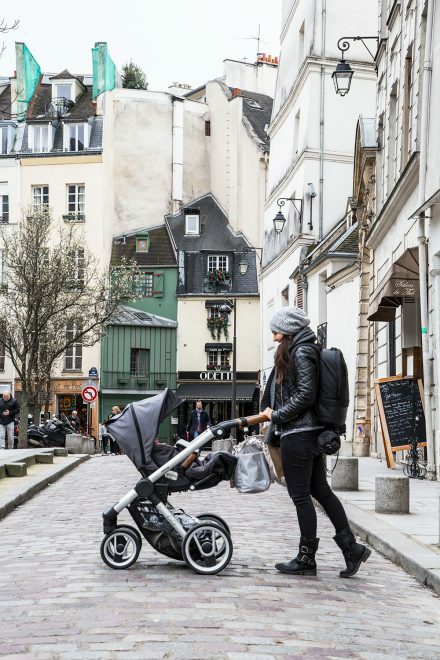 Stroller: if you don’t want to take your own stroller to Paris, there are different companies offering the possibility of renting strollers in the city. Since we took our own, we didn’t get to use this service, though it might be worth the try. Travel crib: in case your accommodation doesn’t offer one. Changing pad: a must when changing on the go, especially in Paris when changing tables are hard to find.